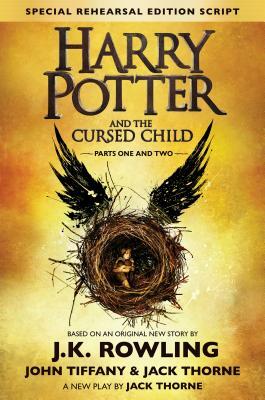 Based on an original new story by J.K. Rowling, John Tiffany, and Jack Thorne, a new play by Jack Thorne, Harry Potter and the Cursed Child is the eighth story in the Harry Potter series and the first official Harry Potter story to be presented on stage. The play will receive its world premiere in London's West End on July 30, 2016. Jack Thorne writes for theatre, film, television and radio. His theatre credits include Hope and Let The Right One In, both directed by John Tiffany, The Solid Life of Sugarwater for the Graeae Theatre Company, Bunny for the Edinburgh Fringe Festival, Stacy for the Trafalgar Studios, 2nd May 1997 and When You Cure Me for the Bush. His adaptations include The Physicists for the Donmar Warehouse and Stuart: A Life Backwards for Hightide. On film his credits include War Book, A Long Way Down and The Scouting Book for Boys. For television his credits include The Last Panthers, Don’t Take My Baby, This Is England, The Fades, Glue and Cast-Offs and the upcoming National Treasure. In 2012 he won BAFTAs for best series (The Fades) and best serial (This Is England 88). John Tiffany directed Once for which he was the recipient of multiple awards both in the West End and on Broadway. As Associate Director of the Royal Court, his work includes The Twits, Hope and The Pass. He was the director of Let The Right One In for the National Theatre of Scotland, which transferred to the Royal Court, West End and St. Ann’s Warehouse. His other work for the National Theatre of Scotland includes Macbeth (also Broadway), Enquirer, The Missing, Peter Pan, The House of Bernarda Alba, Transform Caithness: Hunter, Be Near Me, Nobody Will Ever Forgive Us, The Bacchae, Black Watch, for which he won the Olivier and Critics’ Circle Best Director Awards, Elizabeth Gordon Quinn and Home: Glasgow. Other recent credits include The Glass Menagerie at A.R.T. and on Broadway and The Ambassador at BAM. Tiffany was Associate Director of the National Theatre of Scotland from 2005 to 2012, and was a Radcliffe Fellow at Harvard University in the 2010-2011 academic year.